Prime Minister Theresa May wants trade between the UK and Europe after Brexit to be "as frictionless as possible." But it's increasingly clear that dream is dying. One of the EU's top officials left no doubt on Thursday that May's current plan to ditch rules governing the bloc's internal market and leave its customs union will result in new barriers to trade. "There can be no frictionless trade outside of the customs union and the single market," said Donald Tusk, president of the council of all 28 EU member states. "Friction is an inevitable side effect of Brexit. By nature," he added just hours before a scheduled meeting with May. With little more than a year to go before Brexit, the British government is under increasing pressure from the EU and business groups to put more detail behind its divorce plans. Tensions spiked sharply this week after the EU released a draft legal text based on what was agreed in the first phase of the negotiations. It contained provisions that May said "no UK prime minister could ever agree." May, whose party is riven by internal conflict, has not explained how she plans to address major stumbling blocks that threaten to derail talks with the EU. The British prime minister has said she wants frictionless trade, but also says the UK will leave the customs union and single market. The EU has long maintained that countries outside the single market cannot enjoy its benefits. Related: What is a customs union? There's still a chance that talks could collapse, leading to a dramatic severing of ties that would result in great damage to the UK's economy. May has been urged to detail her plan more clearly in a speech on Friday. Businesses and industry groups have warned that new trade barriers would hurt their operations in the UK. A group of UK lawmakers outlined the consequences for one crucial sector -- autos -- in a report on Thursday. The lawmakers said that retaining access to the single market was crucial for the industry, which supports 900,000 jobs. "Leaving the EU without a deal would undoubtedly be hugely damaging to the UK automotive sector, more so than to other European countries," the Business, Energy and Industrial Strategy committee said. "We urge the government to ... pursue an exercise in damage limitation in the negotiations." 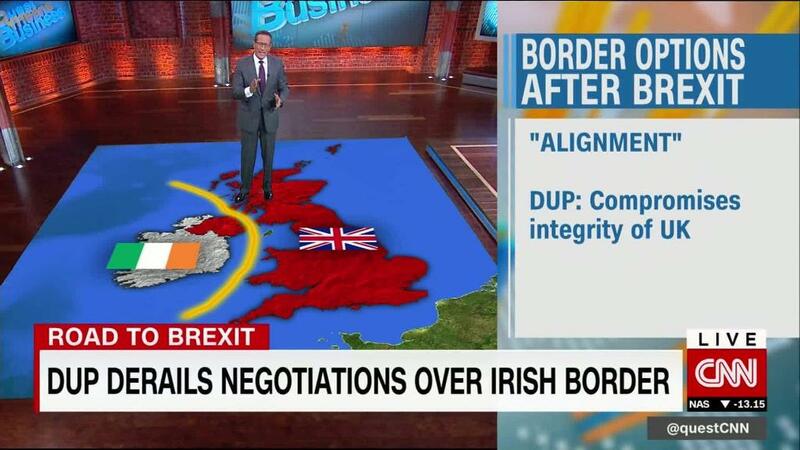 Meanwhile, the UK and EU have been sparring over the return of a physical border on the island of Ireland, an extremely complicated issue that was not fully resolved in the first phase of negotiations. London pledged last year to find a solution that would avoid customs checks at the border between Northern Ireland (part of the UK) and Ireland (part of the EU). But no such proposal has materialized. The EU outlined its position in the draft legal document on Wednesday, proposing a common regulatory area that would keep Northern Ireland in its customs union if Britain does not come up with an acceptable solution. May said that such an arrangement would threaten the "constitutional integrity" of the UK. "In a few hours I will be asking in London whether the UK government has a better idea," Tusk said Thursday.